There are so many different piano methods that as a new student or piano teacher starting out, it can be hard to know which to choose. We shed some light by providing a summary of each of our top ten selling piano method series. Husband and wife team Randall and Nancy Faber have combined forces to develop piano methods and supplemental materials popular for all ages. Basic Piano Adventures progresses gradually and logically through middle C and multi-key approaches. One of the hallmarks of Piano Adventures is that students begin learning a limited set of notes in the middle C position, but play these notes with varied fingerings. This prevents students from associating a particular note with a particular finger. In addition to the Lesson book, each level includes Theory, Performance, Technique & Artistry, Popular Repertoire and Christmas books. 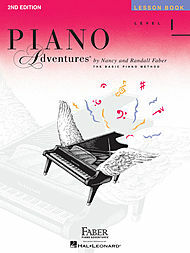 The Piano Adventures series also includes My First Piano Adventures, Accelerated Piano Adventures and Adult Piano Adventures. To learn more, watch our interview with Randall Faber.